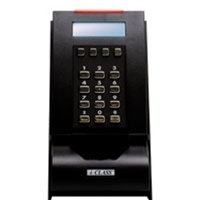 The iCLASS CP575A Card Programmer is designed for on-site programming of access control data, Personal Identification Number (PIN) codes, and user data onto HID iCLASS cards. It allows HID formats, keypad PIN codes and user data fields to be programmed directly into iCLASS contactless smart cards. This enables the system manager to stock blank cards and program cards on demand when new cardholders are added to the system. To ensure security of the format and cards, an iCLASS Card Programmer license is required. The iCLASS CP575A Card Programmer adds fingerprint template program capability for use with the bioCLASS reader. the iCLASS CP575A includes a desktop reader/writer, CD-ROM with programming software and documentation, personalization diskette, universal power supply and USB cable. 205x and iCLASS Tag 206x. Flexible Programming - allows flexible field programming of card numbers. Stores PIN Codes - on the card for use with the iCLASS RK40, RWK400, and RWKL550 keypad readers configured for local PIN verification. User Data - programs four, 16-character user data fields on the card, that can later be read on the programmer. Card Printing - prints card numbers directly onto the cards using a PVC card printer or on standard Avery labels. Security - Maintains a secure, encrypted database on a personal computer. Personalization - Personalized for individual customers (proprietary formats are restricted to authorized users). USB Interface - Card Programmer provides USB user interface capability.